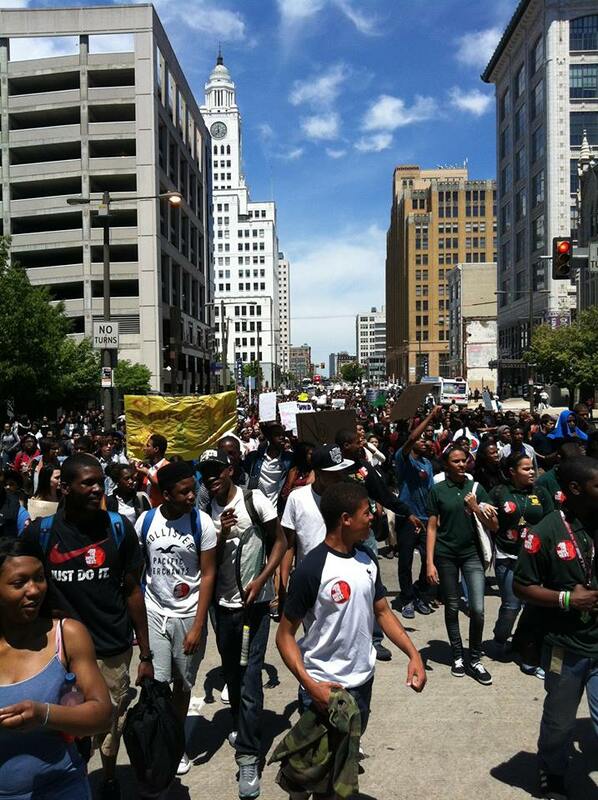 On Friday, May 17th over 2,000 Philadelphia students staged a walkout, rally, and march to voice their opposition to the wave of school closures being planned by their school system. Citing a massive budget deficit as justification, the city is moving to close or relocate at least 23 schools. The already resource-starved schools that remain will face cuts in extracurricular activities, libraries, counselors, and other staff that allow schools to function at a basic level. The racist character of these attacks is revealed by the fact that most of the schools and communities that are being negatively affected are African American and Latino. With the planned closing of public schools has come the expansion of the charter school system. This has not just been an improvised response to an unfortunate budget crisis. Rather, it is part of a calculated effort to gut the public school system and substantially advance the privatization of education in Philadelphia. This plan has been facilitated at the state level by Governor Tom Corbett, who slashed $860 million from the public education portion of the 2011-12 budget. While public schools are starved for funding, charter school expansion is estimated to cost the district at least $139 million over the next five years. The school district brought in the Boston Consulting Group, a business consultant with a record of promoting school closings and charterization in other cities, to mastermind the plan. What this boils down to is that major decisions about education will be made in the corporate boardroom and not by the students, parents, and teachers affected. Resistance to these proposals is being driven by the Philadelphia Coalition Advocating for Public School (PCAPS). The formation of this coalition was actually facilitated by the Occupy movement. The heightened period of activity that began a year and a half ago at Dilworth Plaza brought labor, student, and community activists together into what eventually came to be known as the Occupy Philadelphia Labor Working Group (LWG). Activists within the LWG saw the education fight as a key struggle for the future, regardless of whether Occupy existed or not, and prioritized strengthening connections between various education-related groups with shared interests, including the Philadelphia Student Union, Youth United for Change, and the Philadelphia Federation of Teachers, providing opportunities for deeper collaboration. Different working groups have been established within PCAPS to address the issues of funding, charter school accountability, and community schools. The student walkout on Friday was a wonderful expression of the dynamic potential that exists for this movement. The students were diverse, organized, and perhaps most importantly, they were passionate. The march to City Hall drew car honks and cheers of support from the people passing by. The creative signs decried cuts to the arts, elimination of services, and demanded education equality. Direct parallels cannot be drawn, but the character of the attacks on education in Philadelphia is similar to what communities are facing in Chicago. Chicago Mayor Rahm Emanuel and his cronies are waging an all-out attack on students, unions, and communities of color through their attacks on the Chicago Teachers Union and proposals to close over 50 schools. A social movement led by the union and rooted in the communities most affected was able to at least temporarily check this assault last fall and raise a glimmer of hope for the future. The Chicago Teachers Union was not afraid to highlight the racist character of the attacks, calling it “education apartheid,” and name the real enemy, the one percent. Without a militant social movement that can unite teachers, students, and the communities that will be most negatively affected by policies, as existed in Chicago around the time of the teachers strike, there is little chance that the school closings in Philadelphia can be beaten back. 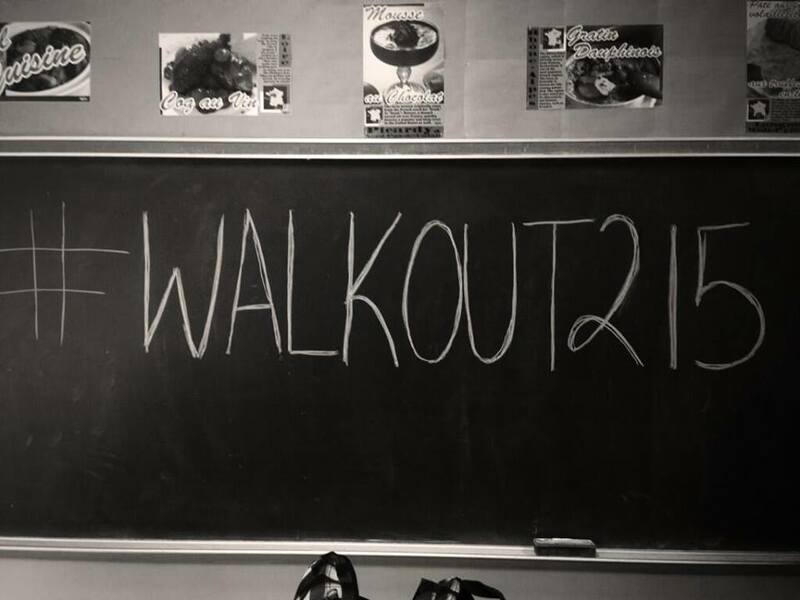 However, the May 17 walkout was a welcome sign of things to come and gives us all a reason to be hopeful. Paul Prescod is a member of Solidarity and a student at Temple University in Philadelphia. He is active within the PCAPS coalition.